Like inked-up bandmates Harry Styles and Zayn Malik, One Direction’s Louis Tomlinson is also working his way up to a half- or full-sleeve tattoo – one little tat at a time. 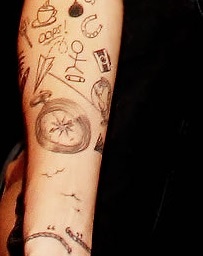 Louis has a dozen or more tattoos inked on the inside and outside of his right arm, many of which are the tiny random doodles that the One Direction boys are famous for, while others are larger and more detailed and intricate. Even though they may seem random to some people though, all of Louis’ arm tattoos have an important meaning to the singer, and we have all the info you need to get up-to-date on Louis’ tattoos right here! Read on to learn about all of Louis Tomlinson’s tattoos on his right arm and the meaning behind them. During the June 2013 tattoo session that resulted in Zayn Malik’s Perrie Edwards tribute tattoo, Louis Tomlinson sneakily added three tiny tattoos to his collection – a bomb, a lit match and a spiderweb on his forearm, as part of the half sleeve the pop star is diligently working on. Louis’ bomb tat is inked on the inside of his right arm, in between his cup of tea and horseshoe tattoos, and features a black bomb with a lit fuse, like you see in cartoons. 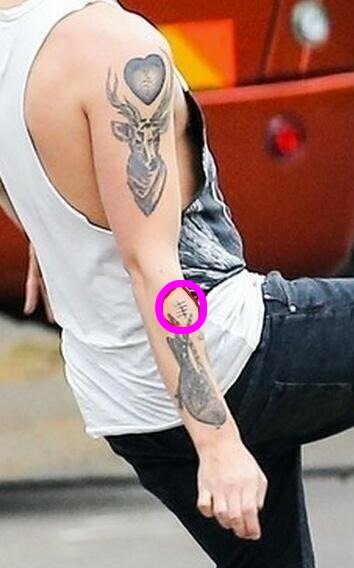 Louis’ arm tattoo was inked by an anonymous tattoo artist at Tattooed Heart Studios in Glen Burnie, Maryland. One of Louis Tomlinson’s first-ever tattoos was the stick figure he had inked on the inside of his right forearm during a trip to London in October 2012. According to Louis, he got the unique tattoo because “I love skateboarding. It’s my hidden talent.” Well that explains it then! The stick figure is inked just below Louis’ inner elbow on his right arm, and, like many of the One Direction boys’ tattoos, Louis’ arm tat is a pretty rudimentary design – dare we say a scribble. The image depicts a simple stick figure man doing a trick on a skateboard while riding downhill. Although Louis hasn’t said much more about his stick figure tattoo in public, the ink is oddly similar to Cher Lloyd’s stick figure tattoo, which is inked on the back of her ankle. Could the tats be related? Most people get horseshoe tats as a symbol of good luck or perhaps because they love horses or horseback riding. Not Louis Tomlinson though! The horseshoe tattoo Louis has inked on the inside of his right forearm, just above his stick figure tattoo, has a very different meaning for the singer. “I own a football team in Doncaster and that is our mascot,” Louis said about his arm tattoo. The pop star reportedly bought his hometown’s football (soccer) team, The Three Horseshoes, in August 2012, after hearing that the team couldn’t afford to buy new uniforms. Apparently, Louis played for the team before auditioning for The X Factor, and found it in his heart to help the guys out with his new-found fame and riches. Any pop star would probably admit that, along with all the good things, there are also some bad things about being a celebrity, including being away from home so often. 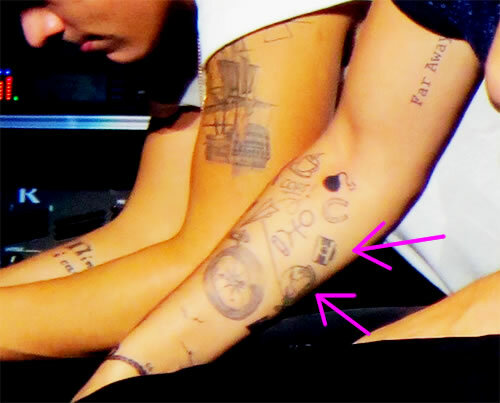 As a tribute to his home in London, Harry Styles once opted for a giant ship tattoo on his left arm, while Louis Tomlinson got a more discreet but still pretty large compass tat for the same reason. “It has an arrow pointing to home. I miss it,” Louis said about his compass tattoo, which is inked on the inside of his right forearm, just below his stick figure tattoo and above his flock of birds tat. 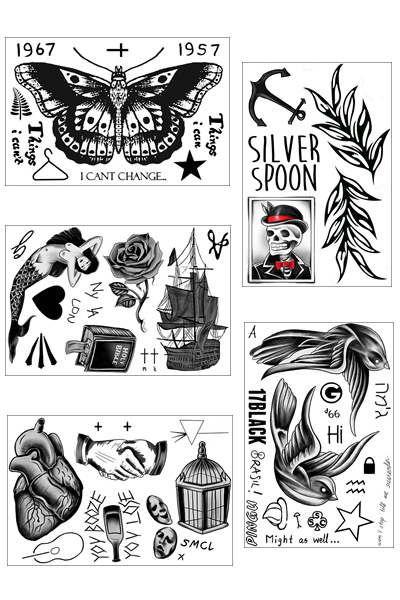 Louis Tomlinson’s tattoo was inked in December 2012 at the Shamrock Social Club tattoo parlor in West Hollywood, at the same time as Zayn Malik’s tattoo of a skull on his arm. On the inside of his right wrist, Louis has a barely visible tattoo depicting a set of empty quotation marks inked in black. When Louis first got his quotation marks tat in October 2012, there was speculation that the ink had something to do with Harry Styles’ “I can’t change” tattoo, which is located in the exact same spot as Louis Tomlinson’s tattoo. There are plenty of rumors swirling around about a possible relationship between Harry and Louis, and the singers’ wrist tattoos seemed to lend at least a little validity to that. According to Louis, however, the meaning behind his quotation marks tattoo is this: “I give a lot of advice and make quotes. I talk a lot as well.” Well there you have it, mystery solved! There’s no doubt that Louis Tomlinson and his bandmates love random tattoos, and Louis’ “OOPS!” tattoo on his arm definitely falls into this category. Shortly after inking the stick figure on his arm, the pop star added another tat to what is well on its way to becoming a half-sleeve: the word “OOPS!” with two lines below for emphasis. The singer’s arm tat was inked in Los Angeles and was first revealed in November 2012. According to Louis himself, “[Oops! is] the first word I said to Harry when we met…” Isn’t that cute! “I also make plenty of mistakes,” Louis elaborated on his arm tattoo meaning. 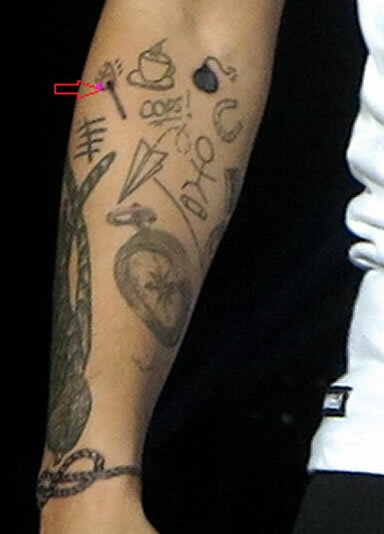 Similar to Louis’ “OOPS!” tattoo is Zayn Malik’s tattoo of the word “Friday,” which was inked because the singer is always asking if it’s Friday yet. Harry Styles also has the word “Hi” inked on his arm, and, according to one source, Louis’ “OOPS!” tattoo is actually inked in Harry’s handwriting. We wouldn’t be surprised if “Hi” is the first word Harry said to Louis! Another small tat Louis Tomlinson sports on his right arm is a cup of hot tea, which is located just above his “OOPS!” tattoo. 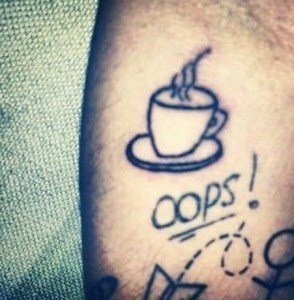 Louis’ cup of tea tat is inked in black and white and the design is very simple, like many a One Direction tattoo. 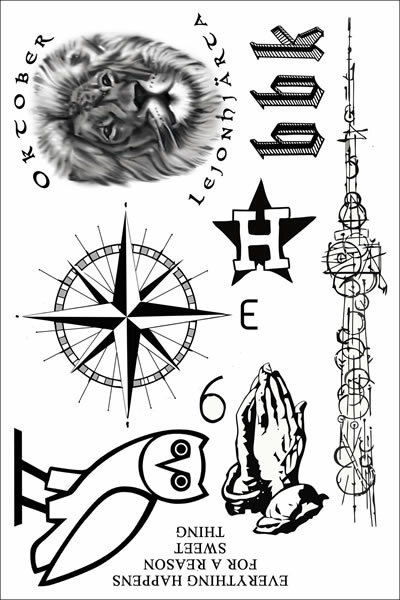 There are different interpretations of Louis Tomlinson’s tattoo depending on who you talk to. According to Louis himself, “I’m obsessed with Yorkshire tea. 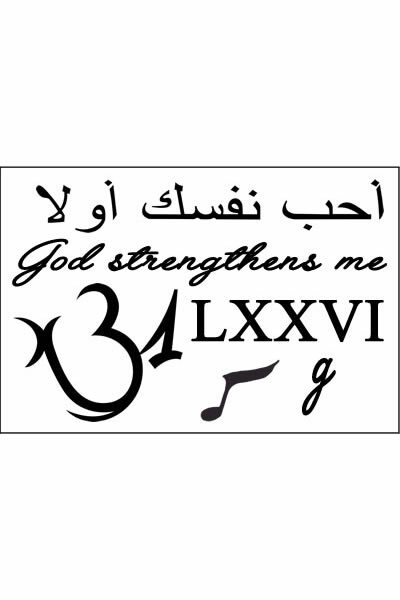 Satisfies me,” which could certainly explain the reasoning behind his arm tattoo. On the other hand, One Direction also has a song called “Little Things,” which includes the lines: “You can’t go to bed without a cup of tea / And maybe that’s the reason that you talk in your sleep.” So, Louis’ arm tattoo is either a tribute to his band’s hit song or his favorite tea! 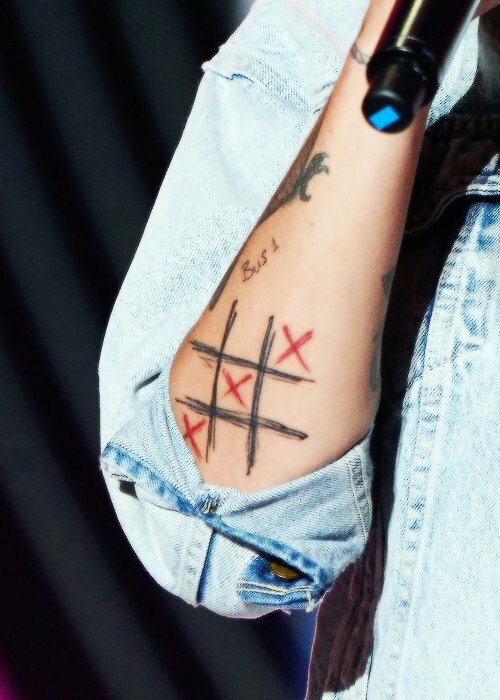 Not many people know about Louis Tomlinson’s tattoo that depicts five discreet tally marks on his arm. Louis’ tally mark tattoo is inked on the outside of his right forearm, along with more than a dozen other tattoos, and is sort of crude, which seems to be the style the One Direction boys favor when it comes to tattoos. Some people have speculated that Louis’ arm tattoo of the 5 tally marks could represent him and his four bandmates – Zayn, Harry, Liam and Niall – but we believe the true meaning behind the singer’s tally mark tattoo is related to the British science fiction television show Doctor Who. To keep track of their encounters with an alien race known as the Silence, the characters on Doctor Who mark tallies on their bodies. Louis isn’t the only One Direction band member to have a tattoo tribute to a British TV show. Harry Styles shares a tattoo with pal Ed Sheeran dedicated to the British cartoon show called Pingu. It seems as though a flock of birds wasn’t enough bird action for Louis Tomlinson, because he got inked two months later, in January 2013, with a gigantic tattoo of a swift bird on his arm. 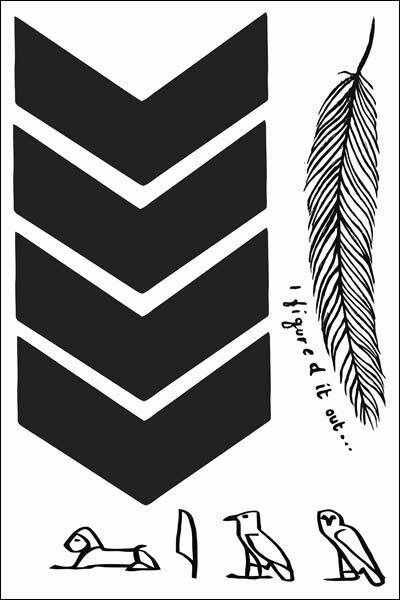 Louis’ bird tattoo is inked on the outside of his right forearm, and features a large black and white image of a bird, reaching from below his elbow all the way to his wrist. Although Louis is reportedly petrified of birds, he says he got the swift bird tattoo because it’s his favorite kind of bird. You’ve got us stumped, Louis! 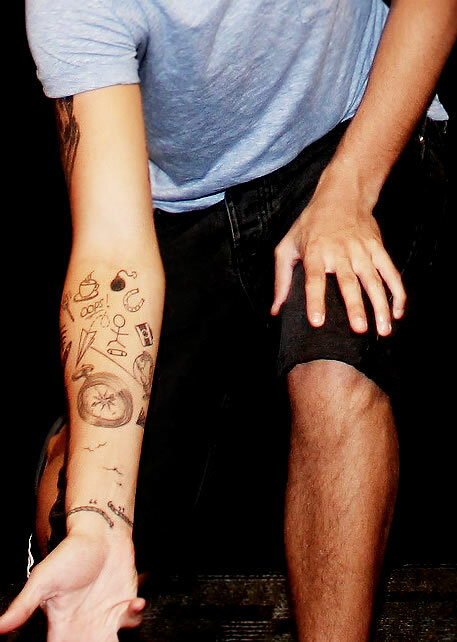 Next to his stick figure tattoo, Louis Tomlinson has a crude little tattoo of a camera tilted on its side. Louis’ arm tattoo was inked in December 2012, and, according to Louis, the ink “represents all the photo shoots I have.” The One Direction boys are pretty darn popular in the United States and throughout the world, and we can imagine they are dragged all over the country (and beyond) for concerts, tours and yes, even photo shoots. Although it doesn’t exactly symbolize his experience in the music industry, Louis Tomlinson’s camera tattoo does stand for something that is important to him. Obviously he is committed to One Direction, and doing photo shoots with his other band members is a big part of that commitment. 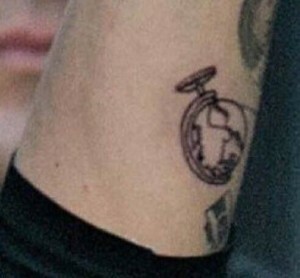 Next to the large compass tattoo on his arm, Louis Tomlinson sports a black and white tattoo of a globe, which the pop star says represents One Direction’s worldwide fame. “It’s for the award we – 1D got at the BRIT Awards this year for Global Success,” Louis said about his arm tattoo. It’s sweet that Louis will always be able to look at his arm tattoo and remember his One Direction days, even after the band is no longer together. Louis’ globe tat was inked around the same time as the rest of the small tattoos on his arm, and is part of what will probably end up being a half or full sleeve for the inked-up singer! 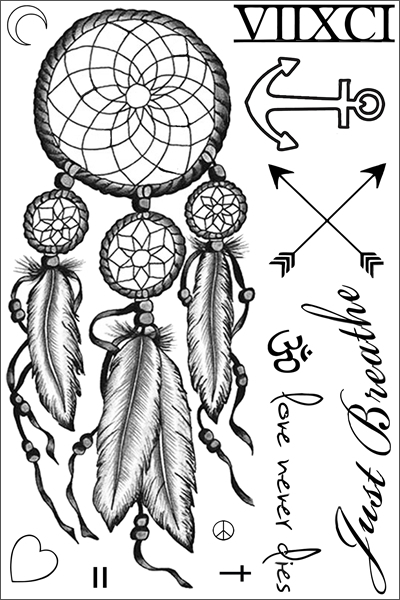 Although most people thought Louis Tomlinson left that June 2013 tattoo session in Glen Burnie, Maryland with just the infinity rope tattoo on his wrist, the singer actually added three additional tats to his collection. 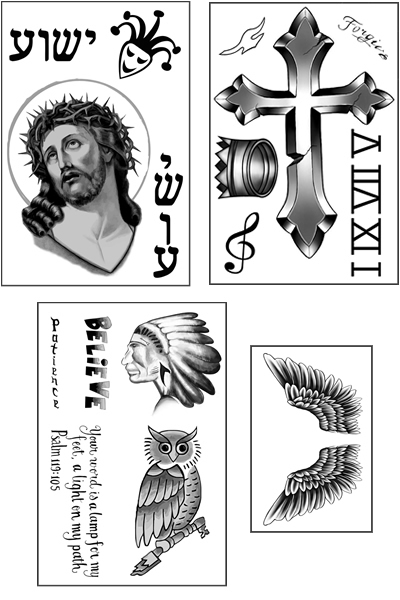 In addition to a spiderweb tattoo and a bomb tat with a lit fuse, Louis also got inked with an image of a lit match. The singer’s lit match tattoo is discreetly located on the inside of his right forearm, above his paper airplane tattoo and below his tattoo of a cup of tea. We’re not entirely sure about the meaning behind Louis’ arm tattoo, but it could definitely tie in with his cartoonish bomb tattoo, which has a lit fuse. 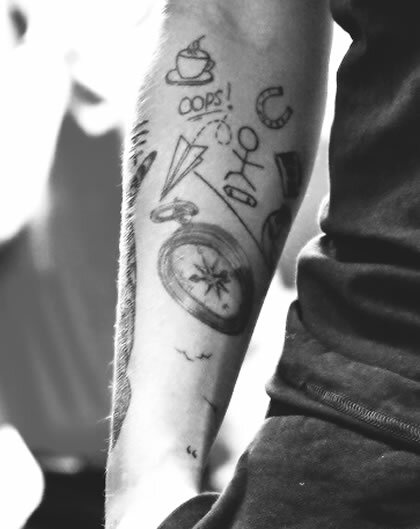 Louis took a little break from inking up his arm until June 2013, when he got a tattoo of a rope on his right wrist. Louis’ wrist tattoo features a black and white rope twisted into the shape of an infinity symbol on the outside of his wrist. 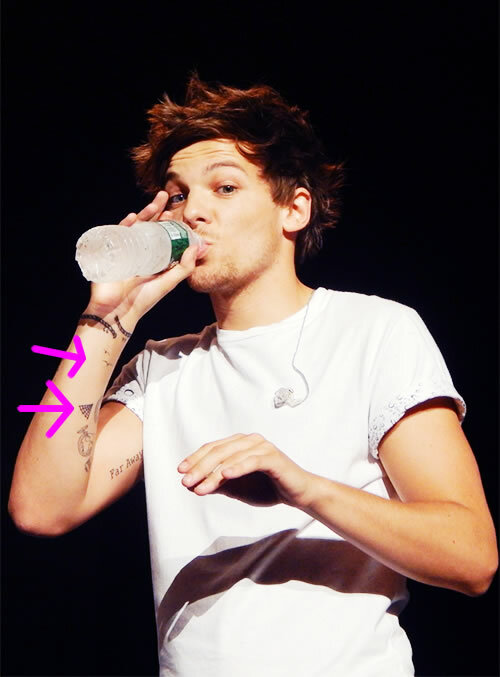 The rope encircles Louis’ entire wrist, meeting up with the singer’s quotation marks tattoo, with the two ends of the infinity rope disconnected on the inside portion of his wrist. Although Louis hasn’t explained the meaning behind his rope tattoo, fans are speculating that the ink represents broken ties of some sort. It’s interesting that Louis chose that particular location for the rope tattoo, especially since the broken part of the rope intermingles with the quotation marks tat that so many people believe relates to Harry Styles. Apparently, Louis Tomlinson suffers from a condition called ornithophobia, which is a fear of birds. According to the singer, “I’m scared of birds and pigeons, I can’t stand them. And, one once flew into my bathroom window. I went in to have a wee, minding my own business and ‘WHOA…there’s a bird in my bathroom!” Louis seems to have gotten over his fear of birds long enough to get inked though, adding a tattoo to his arm in November 2012 that features a flock of five birds in flight. These aren’t just any birds though; they represent the five guys in One Direction – Louis, Liam, Niall, Harry and Zayn. “Always stick together. Work as a team. Family and friends are on my side,” Louis offered as an explanation for his flock of birds tattoo on his arm. 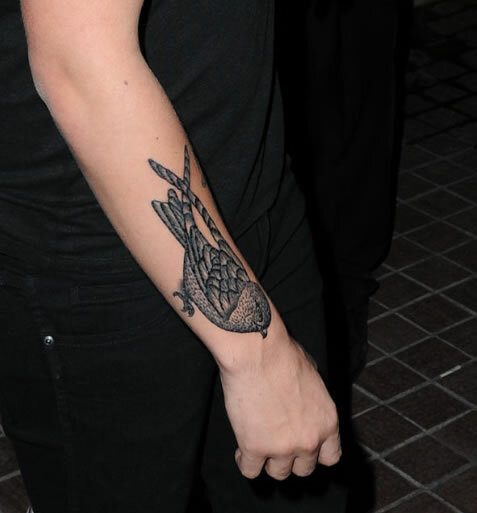 During the same tattoo session at Tattooed Heart Studios in June 2013, Louis got inked with a small tattoo of a spiderweb on the inside of his right forearm, near his globe tattoo. Similar to the inspiration behind Zayn Malik’s “ZAP!” tattoo – which is his love for comic books – Louis reportedly got the spiderweb tat on his arm because he is a big fan of Spider-Man. The arm tattoo depicts a tiny black and white spiderweb that looks like it was just ejected from Spider-Man himself! For some reason, these One Direction boys are big fans of tiny tattoos, and at this rate, Louis could end up with 20+ tattoos on his arm before he even completes his half sleeve! During what must have been a marathon tattoo session on August 10, 2013, Louis Tomlinson and Zayn Malik added several new tattoos to their bodies, including matching “BUS 1” tattoos. 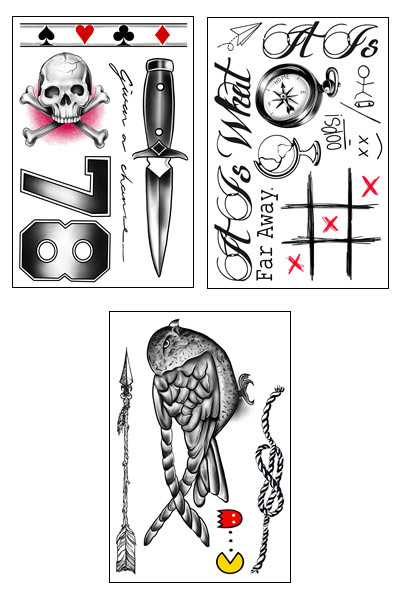 Louis’ “BUS 1” tat is inked on the outside of his right forearm, as part of his half-sleeve-in-progress, and matches Zayn Malik’s tattoo that says “BUS 1” on the outside of his left hand. Zayn and Louis’ matching tattoos were inked in Los Angeles during the North American leg of One Direction’s Take Me Home tour – at the same time as Louis’ tic-tac-toe and playing card suits tats – and were meant as a tribute to the band’s tour bus. Like Louis’ “OOPS!” tattoo, the “BUS 1” tat on his arm looks like it could be inked in Harry Styles’ handwriting. I just think his tats look amazing, they really make his life easier to understand and I really love the idea of the tally marks that represent the boys! Louis I just want to say that I absolutely love you to pieces and you are my idol!! Anybody looked here and tried to draw them on to their arm? Well, I did it.